Melissa Morgan : The Chicken or the Egg? Which came first? Or, to equate that to writing terms, which comes first, your characters or the story? That's a conundrum that's been bothering me a lot lately as I seem to have acquired several characters but no story to put them in! Apparently there are only seven basic plots out there but what happens if your characters won't fit into any of them? Are they just too stubborn or is it simply a lack of imagination on my part? Only twice in my writing career have characters and story popped up together, out of the blue, and it is only those times that the book has really flowed, almost of its own accord. Is that inspiration? If so, what do you do when, as is the case most of the time, inspiration doesn't strike and writing is just a matter of sitting down, putting your fingers to the keyboard and working at it? So many questions and no answers! 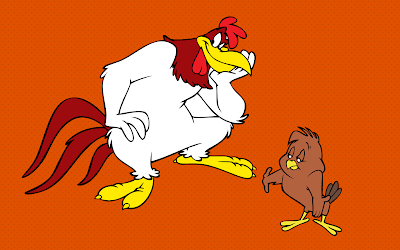 Foghorn Leghorn - the irrepressible rooster! Or are there? Writers' block is easy to recognize, even though it comes in many forms from procrastination to denial, but it is very hard to break through. Eating chocolate, going for a walk, watching a movie, retail therapy, you name it, are all only temporary fixes, though sometimes that's all that's needed. Longer term blocks, however, can be so disheartening you wonder if you will ever write again. Then a writing friend who you really admire emails to say she is in exactly the same boat and you realise it's not just you! That people with real talent, who you know without a shadow of a doubt will succeed, suffer the same agonies of self-doubt and disillusionment too. I don't hold with misery liking company but I am a firm believer in the power of friendship, and the mutual understanding and support that is found among writers is nothing short of a blessing. And suddenly, just knowing you are not alone shifts everything from negative to positive. It may still feel like pushing a boulder up a hill but having the encouragement and belief that you can do it makes everything possible.